Sustainable architecture is architecture that seeks to minimize the negative environmental impact of buildings by efficiency and moderation in the use of materials, energy, and development space and the ecosystem at large. Sustainable architecture uses a conscious approach to energy and ecological conservation in the design of the built environment. The idea of sustainability, or ecological design, is to ensure that our actions and decisions today do not inhibit the opportunities of future generations. K2 sustainable apartments in Windsor, Victoria, Australia by DesignInc (2006) features passive solar design, recycled and sustainable materials, photovoltaic cells, wastewater treatment, rainwater collection and solar hot water. The passivhaus standard combines a variety of techniques and technologies to achieve ultra-low energy use. Following its destruction by a tornado in 2007, the town of Greensburg, Kansas (USA) elected to rebuild to highly stringent LEED Platinum environmental standards. Shown is the town's new art center, which integrates its own solar panels and wind generators for energy self-sufficiency. Energy efficiency over the entire life cycle of a building is the most important goal of sustainable architecture. Architects use many different passive and active techniques to reduce the energy needs of buildings and increase their ability to capture or generate their own energy. One of the keys to exploit local environmental resources and influence energy-related factors such as daylight, solar heat gains and ventilation is the use of site analysis. Numerous passive architectural strategies have been developed over time. Examples of such strategies include the arrangement of rooms or the sizing and orientation of windows in a building, and the orientation of facades and streets or the ratio between building heights and street widths for urban planning. An important and cost-effective element of an efficient heating, ventilating, and air conditioning (HVAC) system is a well-insulated building. A more efficient building requires less heat generating or dissipating power, but may require more ventilation capacity to expel polluted indoor air. Significant amounts of energy are flushed out of buildings in the water, air and compost streams. Off the shelf, on-site energy recycling technologies can effectively recapture energy from waste hot water and stale air and transfer that energy into incoming fresh cold water or fresh air. Recapture of energy for uses other than gardening from compost leaving buildings requires centralized anaerobic digesters. HVAC systems are powered by motors. Copper, versus other metal conductors, helps to improve the electrical energy efficiencies of motors, thereby enhancing the sustainability of electrical building components. Site and building orientation have some major effects on a building's HVAC efficiency. Passive solar building design allows buildings to harness the energy of the sun efficiently without the use of any active solar mechanisms such as photovoltaic cells or solar hot water panels. Typically passive solar building designs incorporate materials with high thermal mass that retain heat effectively and strong insulation that works to prevent heat escape. Low energy designs also requires the use of solar shading, by means of awnings, blinds or shutters, to relieve the solar heat gain in summer and to reduce the need for artificial cooling. In addition, low energy buildings typically have a very low surface area to volume ratio to minimize heat loss. This means that sprawling multi-winged building designs (often thought to look more "organic") are often avoided in favor of more centralized structures. Traditional cold climate buildings such as American colonial saltbox designs provide a good historical model for centralized heat efficiency in a small-scale building. Windows are placed to maximize the input of heat-creating light while minimizing the loss of heat through glass, a poor insulator. In the northern hemisphere this usually involves installing a large number of south-facing windows to collect direct sun and severely restricting the number of north-facing windows. Certain window types, such as double or triple glazed insulated windows with gas filled spaces and low emissivity (low-E) coatings, provide much better insulation than single-pane glass windows. Preventing excess solar gain by means of solar shading devices in the summer months is important to reduce cooling needs. Deciduous trees are often planted in front of windows to block excessive sun in summer with their leaves but allow light through in winter when their leaves fall off. Louvers or light shelves are installed to allow the sunlight in during the winter (when the sun is lower in the sky) and keep it out in the summer (when the sun is high in the sky). Coniferous or evergreen plants are often planted to the north of buildings to shield against cold north winds. In colder climates, heating systems are a primary focus for sustainable architecture because they are typically one of the largest single energy drains in buildings. In warmer climates where cooling is a primary concern, passive solar designs can also be very effective. Masonry building materials with high thermal mass are very valuable for retaining the cool temperatures of night throughout the day. In addition builders often opt for sprawling single story structures in order to maximize surface area and heat loss. Buildings are often designed to capture and channel existing winds, particularly the especially cool winds coming from nearby bodies of water. Many of these valuable strategies are employed in some way by the traditional architecture of warm regions, such as south-western mission buildings. In climates with four seasons, an integrated energy system will increase in efficiency: when the building is well insulated, when it is sited to work with the forces of nature, when heat is recaptured (to be used immediately or stored), when the heat plant relying on fossil fuels or electricity is greater than 100% efficient, and when renewable energy is used. Active solar devices such as photovoltaic solar panels help to provide sustainable electricity for any use. Electrical output of a solar panel is dependent on orientation, efficiency, latitude, and climate—solar gain varies even at the same latitude. Typical efficiencies for commercially available PV panels range from 4% to 28%. The low efficiency of certain photovoltaic panels can significantly affect the payback period of their installation. This low efficiency does not mean that solar panels are not a viable energy alternative. 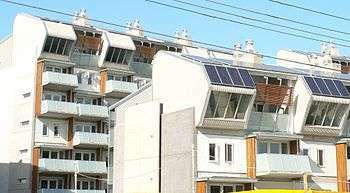 In Germany for example, Solar Panels are commonly installed in residential home construction. Roofs are often angled toward the sun to allow photovoltaic panels to collect at maximum efficiency. In the northern hemisphere, a true-south facing orientation maximizes yield for solar panels. If true-south is not possible, solar panels can produce adequate energy if aligned within 30° of south. However, at higher latitudes, winter energy yield will be significantly reduced for non-south orientation. To maximize efficiency in winter, the collector can be angled above horizontal Latitude +15°. To maximize efficiency in summer, the angle should be Latitude -15°. However, for an annual maximum production, the angle of the panel above horizontal should be equal to its latitude. 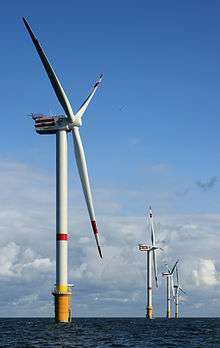 The use of undersized wind turbines in energy production in sustainable structures requires the consideration of many factors. In considering costs, small wind systems are generally more expensive than larger wind turbines relative to the amount of energy they produce. For small wind turbines, maintenance costs can be a deciding factor at sites with marginal wind-harnessing capabilities. At low-wind sites, maintenance can consume much of a small wind turbine's revenue. Wind turbines begin operating when winds reach 8 mph, achieve energy production capacity at speeds of 32-37 mph, and shut off to avoid damage at speeds exceeding 55 mph. The energy potential of a wind turbine is proportional to the square of the length of its blades and to the cube of the speed at which its blades spin. Though wind turbines are available that can supplement power for a single building, because of these factors, the efficiency of the wind turbine depends much upon the wind conditions at the building site. For these reasons, for wind turbines to be at all efficient, they must be installed at locations that are known to receive a constant amount of wind (with average wind speeds of more than 15 mph), rather than locations that receive wind sporadically. A small wind turbine can be installed on a roof. Installation issues then include the strength of the roof, vibration, and the turbulence caused by the roof ledge. Small-scale rooftop wind turbines have been known to be able to generate power from 10% to up to 25% of the electricity required of a regular domestic household dwelling. Turbines for residential scale use are usually between 7 feet (2 m) to 25 feet (8 m) in diameter and produce electricity at a rate of 900 watts to 10,000 watts at their tested wind speed. Building integrated wind turbine performance can be enhanced with the addition of an aerofoil wing on top of a roof mounted turbine. Solar water heaters, also called solar domestic hot water systems, can be a cost-effective way to generate hot water for a home. They can be used in any climate, and the fuel they use—sunshine—is free. There are two types of solar water systems- active and passive. An active solar collector system can produce about 80 to 100 gallons of hot water per day. A passive system will have a lower capacity. There are also two types of circulation, direct circulation systems and indirect circulation systems. Direct circulation systems loop the domestic water through the panels. They should not be used in climates with temperatures below freezing. Indirect circulation loops glycol or some other fluid through the solar panels and uses a heat exchanger to heat up the domestic water. The two most common types of collector panels are Flat-Plate and Evacuated-tube. The two work similarly except that evacuated tubes do not convectively lose heat, which greatly improves their efficiency (5%-25% more efficient). With these higher efficiencies, Evacuated-tube solar collectors can also produce higher-temperature space heating, and even higher temperatures for absorption cooling systems. Electric-resistance water heaters that are common in homes today have an electrical demand around 4500 kW·h/year. With the use of solar collectors, the energy use is cut in half. The up-front cost of installing solar collectors is high, but with the annual energy savings, payback periods are relatively short. Air-source heat pumps (ASHP) can be thought of as reversible air conditioners. Like an air conditioner, an ASHP can take heat from a relatively cool space (e.g. a house at 70 °F) and dump it into a hot place (e.g. outside at 85 °F). However, unlike an air conditioner, the condenser and evaporator of an ASHP can switch roles and absorb heat from the cool outside air and dump it into a warm house. Air-source heat pumps are inexpensive relative to other heat pump systems. However, the efficiency of air-source heat pumps decline when the outdoor temperature is very cold or very hot; therefore, they are only really applicable in temperate climates. For areas not located in temperate climates, ground-source (or geothermal) heat pumps provide an efficient alternative. The difference between the two heat pumps is that the ground-source has one of its heat exchangers placed underground—usually in a horizontal or vertical arrangement. Ground-source takes advantage of the relatively constant, mild temperatures underground, which means their efficiencies can be much greater than that of an air-source heat pump. The in-ground heat exchanger generally needs a considerable amount of area. Designers have placed them in an open area next to the building or underneath a parking lot. Energy Star ground-source heat pumps can be 40% to 60% more efficient than their air-source counterparts. They are also quieter and can also be applied to other functions like domestic hot water heating. In terms of initial cost, the ground-source heat pump system costs about twice as much as a standard air-source heat pump to be installed. However, the up-front costs can be more than offset by the decrease in energy costs. The reduction in energy costs is especially apparent in areas with typically hot summers and cold winters. Other types of heat pumps are water-source and air-earth. If the building is located near a body of water, the pond or lake could be used as a heat source or sink. 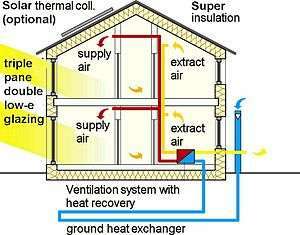 Air-earth heat pumps circulate the building's air through underground ducts. With higher fan power requirements and inefficient heat transfer, Air-earth heat pumps are generally not practical for major construction. Some examples of sustainable building materials include recycled denim or blown-in fiber glass insulation, sustainably harvested wood, Trass, Linoleum, sheep wool, concrete (high and ultra high performance roman self-healing concrete), panels made from paper flakes, baked earth, rammed earth, clay, vermiculite, flax linnen, sisal, seegrass, expanded clay grains, coconut, wood fibre plates, calcium sand stone, locally obtained stone and rock, and bamboo, which is one of the strongest and fastest growing woody plants, and non-toxic low-VOC glues and paints.Vegitative cover or sheild over building envelopes also helps in the same.Paper which is fabricated or manufactured out of forest wood is supposedly hundred percent recyclable .thus it regenrates and saves almost all the forest wood that it takes during its manufacturing process. Sustainable architecture often incorporates the use of recycled or second hand materials, such as reclaimed lumber and recycled copper. The reduction in use of new materials creates a corresponding reduction in embodied energy (energy used in the production of materials). Often sustainable architects attempt to retrofit old structures to serve new needs in order to avoid unnecessary development. Architectural salvage and reclaimed materials are used when appropriate. When older buildings are demolished, frequently any good wood is reclaimed, renewed, and sold as flooring. Any good dimension stone is similarly reclaimed. Many other parts are reused as well, such as doors, windows, mantels, and hardware, thus reducing the consumption of new goods. When new materials are employed, green designers look for materials that are rapidly replenished, such as bamboo, which can be harvested for commercial use after only 6 years of growth, sorghum or wheat straw, both of which are waste material that can be pressed into panels, or cork oak, in which only the outer bark is removed for use, thus preserving the tree. When possible, building materials may be gleaned from the site itself; for example, if a new structure is being constructed in a wooded area, wood from the trees which were cut to make room for the building would be re-used as part of the building itself. Low-impact building materials are used wherever feasible: for example, insulation may be made from low VOC (volatile organic compound)-emitting materials such as recycled denim or cellulose insulation, rather than the building insulation materials that may contain carcinogenic or toxic materials such as formaldehyde. To discourage insect damage, these alternate insulation materials may be treated with boric acid. Organic or milk-based paints may be used. However, a common fallacy is that "green" materials are always better for the health of occupants or the environment. Many harmful substances (including formaldehyde, arsenic, and asbestos) are naturally occurring and are not without their histories of use with the best of intentions. A study of emissions from materials by the State of California has shown that there are some green materials that have substantial emissions whereas some more "traditional" materials actually were lower emitters. Thus, the subject of emissions must be carefully investigated before concluding that natural materials are always the healthiest alternatives for occupants and for the Earth. Volatile organic compounds (VOC) can be found in any indoor environment coming from a variety of different sources. VOCs have a high vapor pressure and low water solubility, and are suspected of causing sick building syndrome type symptoms. This is because many VOCs have been known to cause sensory irritation and central nervous system symptoms characteristic to sick building syndrome, indoor concentrations of VOCs are higher than in the outdoor atmosphere, and when there are many VOCs present, they can cause additive and multiplicative effects. Green products are usually considered to contain fewer VOCs and be better for human and environmental health. A case study conducted by the Department of Civil, Architectural, and Environmental Engineering at the University of Miami that compared three green products and their non-green counterparts found that even though both the green products and the non-green counterparts both emitted levels of VOCs, the amount and intensity of the VOCs emitted from the green products were much safer and comfortable for human exposure. Despite the importance of materials to overall building sustainability, quantifying and evaluating the sustainability of building materials has proven difficult. There is little coherence in the measurement and assessment of materials sustainability attributes, resulting in a landscape today that is littered with hundreds of competing, inconsistent and often imprecise eco-labels, standards and certifications. This discord has led both to confusion among consumers and commercial purchasers and to the incorporation of inconsistent sustainability criteria in larger building certification programs such as LEED. Various proposals have been made regarding rationalization of the standardization landscape for sustainable building materials. Waste takes the form of spent or useless materials generated from households and businesses, construction and demolition processes, and manufacturing and agricultural industries. These materials are loosely categorized as municipal solid waste, construction and demolition (C&D) debris, and industrial or agricultural by-products. Sustainable architecture focuses on the on-site use of waste management, incorporating things such as grey water systems for use on garden beds, and composting toilets to reduce sewage. These methods, when combined with on-site food waste composting and off-site recycling, can reduce a house's waste to a small amount of packaging waste.This is the new techniques of sustainable architecture . One central and often ignored aspect of sustainable architecture is building placement. Although the ideal environmental home or office structure is often envisioned as an isolated place, this kind of placement is usually detrimental to the environment. First, such structures often serve as the unknowing frontlines of suburban sprawl. Second, they usually increase the energy consumption required for transportation and lead to unnecessary auto emissions. Ideally, most building should avoid suburban sprawl in favor of the kind of light urban development articulated by the New Urbanist movement. Careful mixed use zoning can make commercial, residential, and light industrial areas more accessible for those traveling by foot, bicycle, or public transit, as proposed in the Principles of Intelligent Urbanism. The study of Permaculture, in its holistic application, can also greatly help in proper building placement that minimizes energy consumption and works with the surroundings rather than against them, especially in rural and forested zones. A sustainable building consultant may be engaged early in the design process, to forecast the sustainability implications of building materials, orientation, glazing and other physical factors, so as to identify a sustainable approach that meets the specific requirements of a project. Norms and standards have been formalized by performance-based rating systems e.g. LEED and Energy Star for homes. They define benchmarks to be met and provide metrics and testing to meet those benchmarks. It is up to the parties involved in the project to determine the best approach to meet those standards. Critics of the reductionism of modernism often noted the abandonment of the teaching of architectural history as a causal factor. The fact that a number of the major players in the shift away from modernism were trained at Princeton University's School of Architecture, where recourse to history continued to be a part of design training in the 1940s and 1950s, was significant. The increasing rise of interest in history had a profound impact on architectural education. History courses became more typical and regularized. With the demand for professors knowledgeable in the history of architecture, several PhD programs in schools of architecture arose in order to differentiate themselves from art history PhD programs, where architectural historians had previously trained. In the US, MIT and Cornell were the first, created in the mid-1970s, followed by Columbia, Berkeley, and Princeton. Among the founders of new architectural history programs were Bruno Zevi at the Institute for the History of Architecture in Venice, Stanford Anderson and Henry Millon at MIT, Alexander Tzonis at the Architectural Association, Anthony Vidler at Princeton, Manfredo Tafuri at the University of Venice, Kenneth Frampton at Columbia University, and Werner Oechslin and Kurt Forster at ETH Zürich. The term “sustainability” in relation to architecture has so far been mostly considered through the lens of building technology and its transformations. Going beyond the technical sphere of “green” design, invention and expertise, some scholars are starting to position architecture within a much broader cultural framework of the human interrelationship with nature. Adopting this framework allows tracing a rich history of cultural debates about our relationship to nature and the environment, from the point of view of different historical and geographical contexts. Concurrently, the recent movements of New Urbanism and New Classical Architecture promote a sustainable approach towards construction, that appreciates and develops smart growth, architectural tradition and classical design. This in contrast to modernist and globally uniform architecture, as well as leaning against solitary housing estates and suburban sprawl. Both trends started in the 1980s. The Driehaus Architecture Prize is an award that recognizes efforts in New Urbanism and New Classical Architecture, and is endowed with a prize money twice as high as that of the modernist Pritzker Prize. There are conflicting ethical, engineering, and political orientations depending on the viewpoints. There is no doubt Green Technology has made its headway into the architectural community, the implementation of given technologies have changed the ways we see and perceive modern day architecture. While green architecture has been proven to show great improvements of ways of living both environmentally and technologically the question remains, is all this sustainable? Many building codes have been demeaned to international standards. "LEED" (Leadership in Energy & Environmental Design) has been criticized for exercising flexible codes for building to follow. Contractors do this to save as much money as they possibly can. For example, a building may have solar paneling but if the infrastructure of the building's core doesn't support that over a long period of time improvements would have to be made on a constant basis and the building itself would be vulnerable to disasters or enhancements. With companies cutting paths to make shortcuts with sustainable architecture when building their structures it fuels to the irony that the "sustainable" architecture isn't sustainable at all. Sustainability comes in reference to longevity and effectiveness. Ethics and Politics also play into sustainable architecture and its ability to grow in urban environment. Conflicting viewpoints between engineering techniques and environmental impacts still are popular issues that resonate in the architectural community. With every revolutionary technology or innovation there comes criticisms of legitimacy and effectiveness when and how it is being utilized. Many of the criticisms of sustainable architecture do not reflect every aspect of it but rather a broader spectrum across the international community. ↑ shamilton. "Module Pricing". Solarbuzz. Retrieved 2012-11-07. 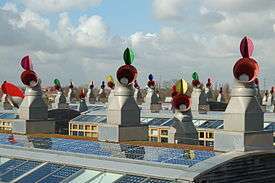 ↑ "Solar Water Heaters". Toolbase.org. Retrieved 2012-11-07. 1 2 3 4 5 John Randolph and Gilbert M. Masters, 2008. "Energy for Sustainability: Technology, Planning, Policy," Island Press, Washington, DC. ↑ James, J.P., Yang, X. Indoor and Built Environment, Emissions of Volatile Organic Compounds from Several Green and Non-Green Building Materials: A Comparison, January 2004. Retrieved: 2008-04-30. ↑ Mark Jarzombek, “The Disciplinary Dislocations of Architectural History,” Journal of the Society of Architectural Historians 58/3 (September 1999), p. 489. See also other articles in that issue by Eve Blau, Stanford Anderson, Alina Payne, Daniel Bluestone, Jeon-Louis Cohen and others. ↑ McGrath, Brian (2013). Urban Design Ecologies: AD Reader. John Wiley & Sons, Inc. pp. 220–237. ISBN 978-0-470-97405-6. ↑ "Beauty, Humanism, Continuity between Past and Future". Traditional Architecture Group. Retrieved 23 March 2014. ↑ "Driehaus Prize". Together, the $200,000 Driehaus Prize and the $50,000 Reed Award represent the most significant recognition for classicism in the contemporary built environment.. Notre Dame School of Architecture. Retrieved 23 March 2014.